The self-described “precocious” 9-year-old Luna uses every big word, along with moves from her one year of ballet class, to put on a show for her team of teddy bears. 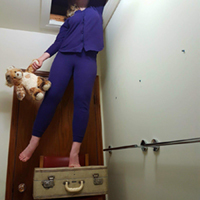 In her world-renowned cabaret, Luna weaves through moments of puppetry, weird body tricks and a light snack break to navigate her way through the upstairs attic. Winnipeg’s Naked Theatre brings you a brand-new show about a young girl searching for an escape from her parents’ messy life. Sarah Flynn hits hard right off the bat with a sock puppet rendition of “Take On Me” which had the entire audience laughing uproariously. She draws everyone in by making you believe she is a young girl named Luna who is trying to create the best show possible by practicing in front of her teddy bears. Luna doesn’t yet grasp the real adult nature of some of her routines, which leads to some very funny cringe inducing moments. The show takes a turn to the dramatic when we learn why it is so important to Luna to put on a good show and it makes the whole show come together. Very well done!